When performing the ball slam, focus on speed and power. A 10 lbs ball is enough to blast your metabolic processes, enhance your fitness, and raise your BMR (basal metabolic rate). In the quick video, I was using a 10 lbs slam ball. For this exercise, speed is more important than weight. 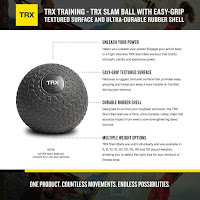 The slam ball I was using in the video is a bit slippery, if you find that to be an issue, here's my affiliate link to the TRX Slam Ball with Easy-Grip Texture. For a complete Fat X 101 fat burning workout that utilizes the Ball Slam exercise, check out the Slam and Spin workout. As always, if you have any questions, feel free to contact me. I only succeed when you succeed! I will always do my best to help you find success in your fat loss and fitness journey. If you're in the Pasadena area, contact me for personal training or to join my FX Boot Camp class.